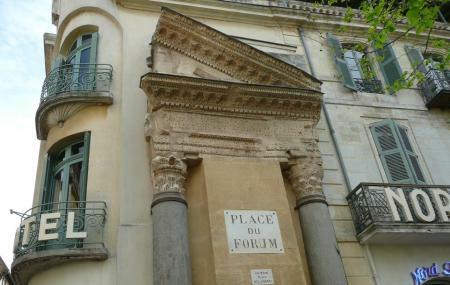 Originally, the Place du Forum was the site of a Roman forum and the centre of the social and political life in Arles. With a part of the original building still standing, intelligently preserved with the help of a new building, the Forum Square is now a popular tourist attraction and a place amalgamated with ancient and modern charm. The sophistication of Roman architecture can be observed in the Place du Forum building as well. The streets today, bustle with excitement and vigour, thanks to a number of cafes that offer scrumptious delights to titillate the taste buds. A major attraction presently at the Place du Forum is the Tambourin Cafe. While most buildings inspired Van Gogh paintings, this cafe is unique for it was inspired from one of Van Gogh’s paintings. The bright cafe is a reconstruction of the one depicted in Van Gogh’s Cafe Terrace. Emanating with energy and allure, the Place du Forum is a must visit for a relaxed afternoon in the city of Arles. How popular is Place Du Forum? People normally club together Eglise And Cloitre St-trophime and Place De La Republique while planning their visit to Place Du Forum.